2-day workshop for 8-10 people with Evan Hastings (USA/India), founder of Shadow Liberation. The workshop will provide 8-10 people training in the Shadow Liberation Method of Performance Dialogue about Gender Violence . 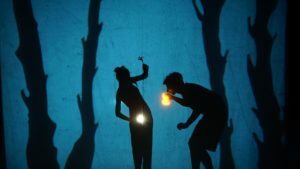 Shadow Theatre offers distancing strategies conducive to playing with taboo or traumatic material in metaphoric, veiled or abstracted ways. This makes it an ideal medium to prompt discussions about gender-based violence, while providing a personally transformative and professionally enriching training for the participants engaged in the ensemble. The ensemble is a microcosm of society. Therefore issues of the society surface in the group. We use the issues that come out of our shared experiences to create nuanced representations of Gender Violence, situated in the lives of the performers. This process requires a courage and honesty from the performers that, through the creative process, changes their lives, awakening the potential to impact lasting social change. Practically speaking, participants will learn how to facilitate creative dialogue about gender violence using Theatre of the Oppressed, Shadow Theatre and Drama Therapy Techniques. Evan has a passion for turning pain into medicine through theatre. His work illuminates the intersection of Drama Therapy and Theatre of the Oppressed, creating performative engagements that raise urgent issues in aesthetic dialogue. Evan has had the honour of animating theatrical dialogue from the fault lines of war zones to the halls of Harvard, from working with prisoners in high security facilities to engaging families through open air performances in public spaces. Theatre is an act of Love. * if the price is not possible for you – please contact us and lets work out a solution together. To ensure participation please register early – only 8-10 people can participate. Early bird price until 21.05.2018. In diesem Workshop erhalten 8-10 Personen die Möglichkeit mit Evan Hastings, dem Gründer von Shadow Liberation, die Methode (eine Mischung aus Schattentheater, Theatertherapie und TdU) intensiv kennenzulernen. Evan hat eine Leidenschaft dafür, Schmerz durch Theater in Medizin zu verwandeln. In seiner Arbeit verknüpft er Drama-Therapie und Theater der Unterdrückten und öffnet so einen Raum, in dem dringende Fragen im ästhetischen Dialog aufgeworfen werden. Evan hatte die Ehre von den Bruchlinien der Kriegsgebiete bis zu den Sälen von Harvard zu jokern, von der Arbeit mit Gefangenen in Hochsicherheitseinrichtungen zur Arbeit Familien durch Aufführungen im öffentlichen Raum. Theater ist ein Akt der Liebe. * Falls die Kosten deine Möglichkeiten übersteigen – melde dich.